SMS in Google Hangouts 1.3? It's been rumored for months that Google Hangouts will get SMS and MMS message support, and a report from yesterday made that seem even more likely. Android Police rated its confidence in the SMS for Google Hangouts rumor "a 9 out of 10," saying "it's almost a sure thing." According to the Android blog, Google Hangouts' version 1.3 update will add SMS message functionality, possibly merging the mobile OS's existing SMS messaging app with Hangouts just like the last update did with Google Talk. The Hangouts update will reportedly add video sharing as well. And the site produced alleged leaked screenshots, seen above, to prove it. SMS messages sent via Hangouts will reportedly sport a "via SMS" tag so users know exactly what the app is doing. MMS multimedia messages will also be supported, though the site could not confirm with its sources whether that includes MMS video or just MMS images. 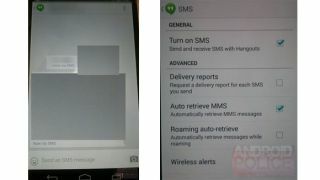 And the leaked screenshot shows settings toggles that include wireless alerts, auto-retrieval of SMS messages while roaming and otherwise, delivery reports, and a toggle for SMS in Hangouts itself. The one thing this rumor lacks is an expected release date for the Google Hangouts 1.3 update, but if the screenshot is legit then SMS in Hangouts is probably being tested and could arrive soon. Here's everything we've heard about the next version of Google's mobile operating system, Android 4.4: KitKat.